The constant giggling, although cheerful, even of the acting Chief Justice Himself, William Atuguba, is the best entertainment the World has ever known in regards to the Supreme Court proceedings. When a judge cannot finish a sentence, you wonder if it is because he cannot grammatically construct one, afraid of his vocabulary or perhaps more interested in appeasing his own political bias. Not that it matters what language a judge speaks, but it is only expedient that a Supreme Court Justice be fluent, methodical and intelligent in the given language for which he presides as judge. When we come to call this court – currently hearing a petition of election fraud in the just ended 2012 Presidential and Parliamentary Elections – the supreme court of the land, it is difficult to grasp the laissez-faire attitude of the judges, the counsels, the witness who is for now Dr. Bawumia, and the behavior in sum of all attending. Suffice it to say that the only class act we find in this courtroom since this hearing begun sadly happens to be the infamous Mr. Tsatsu Tsikata who seems to harbor some decorum for court proceedings and quotes some of Ghana’s British colonial laws to admirable dexterity. Any indication of a full and contrite grasp of the law of Ghana and a sense of proprietary good taste in conduct or in appearance refuses to show on Justice William Atuguba and co. Respect for order and protocols for methodic proceedings in court have been completely absent. The only witness we’ve had so far, Dr. Bawumia, has oftentimes refused to answer questions posed to him and feels the need to be over elaborative, over confident and over ‘intelligent’ in his own grasp and comprehension of what may have transpired at the polling stations that have been alleged for election fraud in Ghana. The three leading members of the New Patriotic Party (NPP), namely Nana Akufo-Addo, Dr. Mahamudu Bawumia and Mr. Jake Obetsebi Lamptey – the NPP Chairman – who are praying the Court to nullify the Electoral Commission’s declaration of President John Mahama as the winner of the December 2012 election, cut a disturbing figure for Ghana’s politics. They feel entitled, particularly Nana Akufo-Addo, who should already be sitting on tenterhooks; he is unable to produce his law degree certificates and documentations of his call to the Ghana Bar that led to his appointment to Attorney General of the land during President John Kufuor’s regime. These ‘three musketeers’ are citing statutory and constitutional violations and irregularities at polling stations across the country. Allegations that one would hope the highest court of the land would take very seriously. President John Dramani Mahama, the Electoral Commission and the National Democratic Congress (NDC) are the other ‘three stooges’ or call them respondents, in the case currently before the Court. The Ghana Broadcasting Corporation’s television (GTV) transmission of this court is another matter altogether. It lacks any technical knowhow and expertise. From microphones not working to high-pitched sounds blurring our hearing of the already indecipherable voices, including the mumbo jumbo of Justice Atuguba himself, to the 19th Century cinematographic techniques, GTV has carved a disconcerting figure of Ghana’s Supreme Court in front of the world. More important, I wonder what these Supreme Court judges think of the socio-political effect of such proceedings on a country that is already rife with political tension and ethnic cronyism. Ghana will not be less damaged if Nana Akufo-Addo does not become President. However, Nana Akufo-Addo will nonetheless be broken either from this, or Justice Francis Yaonasu Kpegah will strip him naked before the country for doctoring his way to the Attorney General position under President Kufuor. Even further, there is a potential socio-political damage to the country and the peace we currently enjoy. This makeshift of a Supreme Court would have surprised the world if they had weighed the country’s interest against the petitioners and dismissed the case before it turned into this circus. But it seems, as childish as it may sound, that our justices were eager to do their version of Azonto on television. It will be pragmatic for the ‘British Built’ Supreme Court of Ghana – since our leaders cannot think beyond colonialism – to dismiss the case in the name of national good. Save for some unrest on our Accra-Kumasi streets that will probably be incited by some vociferous NPP gurus, the country will move on. A few disturbances now rather than a full-fledged upheaval from any pronouncement by the Supreme Court, can be perilous to nation building and peace. I have watched with interest and trepidation. The level of vitriol spilling on our street and the incomprehension of this fact by the judges may lead our dear country to places we don’t envision it to be. Please, let’s begin to turn away from this bickering. It will not amount to anything good. Let’s cherish our peace. I hope the supreme court judges will find the wisdom to deal with this case in a professional manner that can bring honour to us and the land. I hope both political parties know what they are doing. As serious as this may sound to critics and lovers abroad, I have to admit that to many Ghanaians here, this is just entertainment – the first of its kind and somehow strips away the gravity of the case we are dealing with. I acknowledge that the court can improve on its level of professionalism. But, perhaps, Justice Atuguba’s way of handling the court proceedings is in the spirit of good faith – to make light an issue that if carried to extreme seriousness may rather lead us astray. I will not praise the Supreme Court judges we have nor the level of decorum with which the proceedings are being carried out, but thses judges are certainly doing some much needed work. It is easy to criticize than perform and probably every Ghanaian lawyer sitting in their offices elsewhere feel they can do a better job. I believe in everyone. And we have to acknowledge that this country and its democracy are growing by the hour. We do ourselves a whole lot of good by acknowledging this fact. America was not built in 50 or so years. We trudge along this path of democracy, our way, nonetheless an imperfect one, but it is ours. This article calls attention and that is what a like about it. We must do more by partaking in our own democracy. This goes to all Ghanaians abroad as well. A great way to partake in our democracy is to get on the internet like Patapaa has, comment and critique. Get on the radio, youtube etc. and do your part. Government is really indeed all of us. Until you talk, you take part, we can’t grow. I don’t want to fully criticize the judges either, I certainly can’t do what they’re doing in the courtroom, unless I am equally trained. But I have to admit that I would never want court proceedings to be handled “in the spirit of good faith” or “to make light an issue” that is brought to court. “Extreme seriousness” is exactly what I would expect in any courtroom. Anything less should be deemed unprofessional. And some of what I witnessed viewing the Supreme Court proceedings was unprofessional. The manner in which this case is conducted seems like the first time a case has been brought to the supreme court! It’s fascinating but it stinks. Until we begin to address professionalism from the home and our schools, it will be difficult to implement it at any level. I am glad you have mentioned the socio-political impact that any sort of ruling on this case may have on our country. I have to admit that I foresee no impact provided that political parties involved can treat the issue with the utmost respect and decorum. However, since you have for many times questioned the level of professionalism amongst the petitioners and respondents, it is difficult to fathom what will transpire in the end. We can only hope that Ghanaians are smarter than these clowns, that we are more committed to peace than politicians and that we understand our own plight and our ordinary drudgery a whole lot more than these sycophants. With that said, I wish Ghana well. This is a case that needs to heard by the Supreme Court anyhow. We are afraid of its consequences but in the end what good is democracy if there’s no uncertainty in it? We have chosen to live by the law, and this is just how it should work, in all cases. 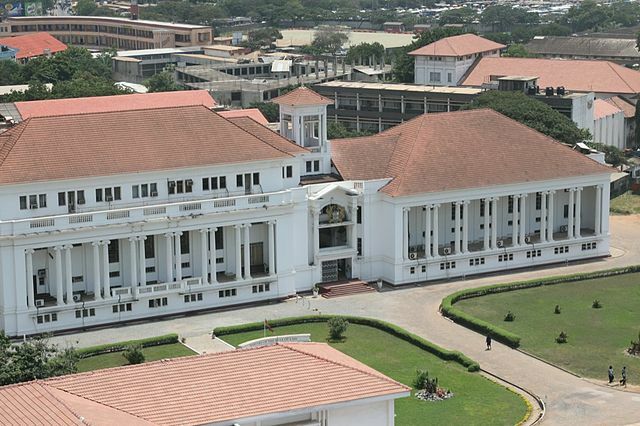 I am glad you mentioned that the Ghana Supreme Court building is the same one the British Colonialists built. Isn’t that a shame? After 56 years of Independence, I am sad that Ghana still practices law withing the walls of a dinosaur, a relic. It is even more shameful that most of these laws being practiced are the copied versions of British Colonial Law. Why is that? I watched the proceedings and it was embarrassing! These are the attorneys representing the Supreme Court? If there was a Supreme Court competition like say the olympics, other countries would tear that court to pieces. Please Ghanaians for your sake promote people because of meritocracy and not because of friendship. The justice system will fail to do justice if it is run by clowns who cannot produce their legal education papers or form complete sentences in whatever language you conduct your court.